The Tivoli Theatre opened on Broad Street in Chattanooga in March of 1921, and when it opened, audiences heard the sound of a 2-manual, 8-rank Bennett organ (about which nothing else is known) that had been placed in the theatre. Three years later, Paramount-Publix acquired the theatre and the Wurlitzer Organ Company shipped their Opus 780, a 3-manual, 11-rank 235 Special (with Piano and Solo couplers) to the Tivoli. From the outset, the organ had an unusual history, with one of the switch stacks labeled “San Diego” and voicer’s initials on the Kinura with the date “1921”. C. Sharpe Minor premiered the Wurlitzer, but the longest-tenured organist was Jean Van Asdale. In 1939, with the opening of Gone with the Wind in Cinemascope, the cable was cut and the console was removed and stored backstage. In the revival of enthusiasm for theatre organs that emerged in the 1950s, the Tivoli’s Wurlitzer became an object of interest for enthusiasts from Chattanooga and Atlanta. Bill Barger directed a group of volunteers, including Clay Holbrook, Edd “Doc” Simmons, and Gary Mull (still a member of the Atlanta Chapter), who began work in 1960 to make the organ playable once again. The console was reconnected and placed under the box seats at house left. A French Trumpet was added to the Main Chamber, increasing the organ to 12 ranks, and some pipes and chests damaged in a water leak were replaced. The organ was enthusiastically received at its re-premiere during a barbershop quartet convention in 1963 with Bill Barger at the console. In 1976, the City of Chattanooga purchased the Tivoli and a decade-long effort began to raise money for a complete restoration of the theatre. In 1983, the city approached Larry Donaldson, already recognized across the South for his work on the Mighty Wurlitzer of the Alabama Theatre, to oversee the rebuilding of the Wurlitzer at the Tivoli. During the restoration of the theatre, the organ was almost completely removed and work on it was done in a downstairs room of the Soldiers and Sailors Memorial Auditorium. The work was accomplished by a dedicated group of volunteers who formed the Chattanooga Theatre Organ Society (CHATTOS) and included Staley McPeak (who would remain a member of the regular work crew until his death in 2008) and Jon Robere (who became house organist at the Tivoli until his passing in 2000). Work on the reeds was done by Trivo and the console was renovated by Walt Winn, his wife Donna, and Rick McGee in Atlanta with a Z-Tronics relay and Trousdale combination action. When the Wurlitzer returned to the Tivoli, the final reinstallation included several changes. The Tuba was moved to the Main Chamber and a Bombarde Trumpet in the Solo Chamber replaced the earlier French Trumpet. Not long thereafter, an English Post Horn was added to the Solo Chamber. Because of the proscenium installation, there was a need to improve the bass sound, so the Tibia was extended to 16’ using a Barton Tibia, the 16’ Wurlitzer Diaphone having already been replaced with a Kilgen Wood Diaphone. The percussions and toy counter were moved to a shelf in the proscenium, unenclosed, and directly over the front orchestra. A second blower was added since the first blower had been relocated quite some distance away from the chambers. In the past few years, with the support of ATOS grants, some reeds have again been refurbished by Trivo, and the Bombarde Trumpet has been replaced by a Kimball Trumpet. The present technical crew consists of volunteers from the Atlanta Chapter of ATOS (CHATTOS having disbanded some years ago) directed by Bert Allee of Manchester, TN, with the support of his wife Ann. Larry Donaldson serves as the principal consultant with respect to technical matters. During the 1990s, the organ was occasionally heard by the public with Jon Robere presiding at the console, and it was occasionally part of the legendary Atlanta Chapter “cave crawls” that took them to various organs throughout southern Tennessee. With the passing of Mr. Robere, public use of the use of the Wurlitzer ended and for years the only ones to hear the organ were the volunteer organ crew and the theatre’s technical director when the crew was working on the organ. Part of this is due to the difficulty in locating the console during shows. Since there is not usually an orchestra pit, there is loss of usable seating when the organ is placed on the orchestra floor, or it must be located on the stage, which presents challenges with set positions. At Christmas in 2007, Grace Academy in Chattanooga requested the organ be played for a few minutes before their annual Christmas program and all were thrilled with the sound of the organ in Ron Carter’s capable hands. A “few minutes” became an hour. It was the first time in almost a decade that the organ had been heard publicly. Their enthusiasm was prophetic of the reception that the Wurlitzer has received since then, as use of the organ has been resurrected. Grace Academy uses the organ each year for their Christmas programs and graduation. The organ, in the pit again along with the orchestra, has been used for Broadway productions at the Tivoli and was the occasion of the first theatre organ appearance of Grant Wolf, a well-known Chattanooga organist, who is now often at the console for programs. 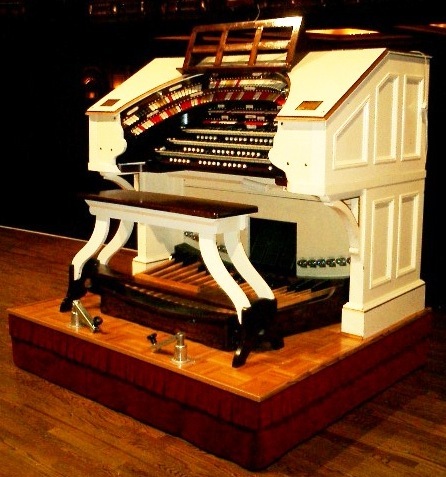 In 2008, print, radio and television ads promoting a Southern Gospel Music concert announced “Gospel Music on the Mighty Wurlitzer Theatre Organ,” and the organ was so well received that the quartets asked that it be played with them during the grand finale. The Chattanooga Boys Choir requested the organ be used during their 50th Anniversary program in 2012 and in the future. Since 2011, the organ has been used to open the “Heartstrings for Hope” country music concert, a benefit for St. Jude’s Children’s Hospital. The program features classic country music on the Wurlitzer, which has even been broadcast live on WUSY-FM, Chattanooga’s powerhouse country music radio station. The Tivoli is called “The Jewel of the South.” The Wurlitzer is the “Jewel within a Jewel,” a historic treasure being rediscovered by a new generation in Chattanooga.